Recycle your old gas powered lawnmowers and get a discount on a new, more efficient model with Green Venture and RONA. 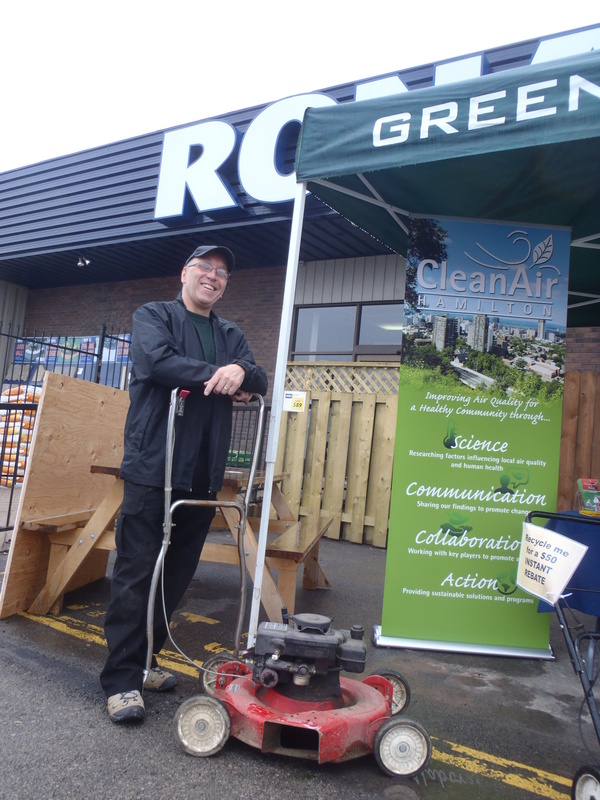 Green Venture in partnership with Hamilton-area RONA Stores, with support from Clean Air Hamilton, Hamilton’s FASTBIN.ca, and Green Circle Recycling, is hosting another ‘Clean Air is a Yard Away’ lawnmower recycling event. On these days gas-powered, walk-behind lawnmowers emptied of fluids can be exchanged for a $50 instant rebate on a new, eco-friendly model and a chance to win a cordless weed trimmer. Each year in Canada, around 80,000 tonnes of harmful emissions are released by gas-powered lawn equipment. By properly recycling old, polluting gas powered lawnmowers for a $50 instant rebate (limit of one per person) on selected new, eco-friendly models at a ‘Clean Air is a Yard Away’ event, consumers can save money and decrease air pollution in their community. In 2011, Green Venture and RONA helped recycle enough highly polluting lawnmowers to save over 1 Tonne of greenhouse gas and smog forming emissions. For more information on ‘Clean Air is a Yard Away’ events, please contact 905-540-8787 ext 113 or email matthew.sweet@greenventure.ca.